Did you know that manta rays have feeding frenzies? 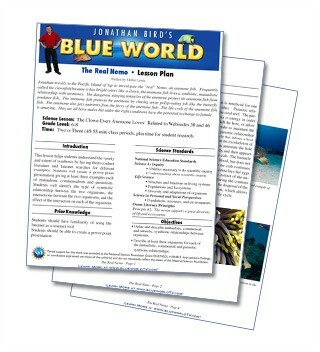 Some Jonathan Bird's Blue World webisodes have an accompanying lesson plan, listed below by webisode number. These are aimed at Grades 6-8 but can be adapted by educators for other educational settings. We welcome feedback on our educational materials. Please email us your suggestions! This Downloadable Lesson Plan Summary Sheet lists the concepts illustrated in each lesson plan. Use "right click" to save the document to your hard drive. Anemonefish have a unique symbiotic relationship with sea anemones. This lesson plan investigates mutualistic, commensal, and parasitic symbiotic relationships in the sea. Sharks have no buoyancy controls (a swim bladder) like other kinds of fish, so they tend to sink if they stop swimming. This lesson plan explores the concept of buoyancy--why things sink or float. It explains how bony fish control their buoyancy and how sharks have alternate strategies for controlling depth in the sea. Colors, patterns and textures are used extensively by ocean animals for camouflage or to help themselves stand out. This lesson plan explores the science of light energy in air and water, and some of the adaptations for survival that benefit from the way in which light travels through water. Coral reef growth is affected by the pH of the water in which it lives. This lesson plan demonstrates how pH is lowered in water with the addition of CO2. It explores the concepts of pH (what are acids and bases) and how a lower pH affects calcium carbonate to better understand "ocean acidification"--the changing of the pH of the ocean due to atmospheric CO2.